Wi-Fi smart plugs from big-name brands typically cost about $25 or $30, and that’s really not such a bad price for something that adds connectivity and smart functionality to all your old dumb devices. Of course, why on Earth would you pay that much when you can get the same features for way less? 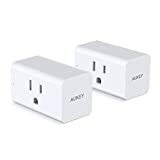 Use the coupon code AUKEY1SP at checkout and you’ll only pay $19.99 for an AUKEY Wi-Fi Smart Plug 2 Pack. That’s only $10 per smart plug!